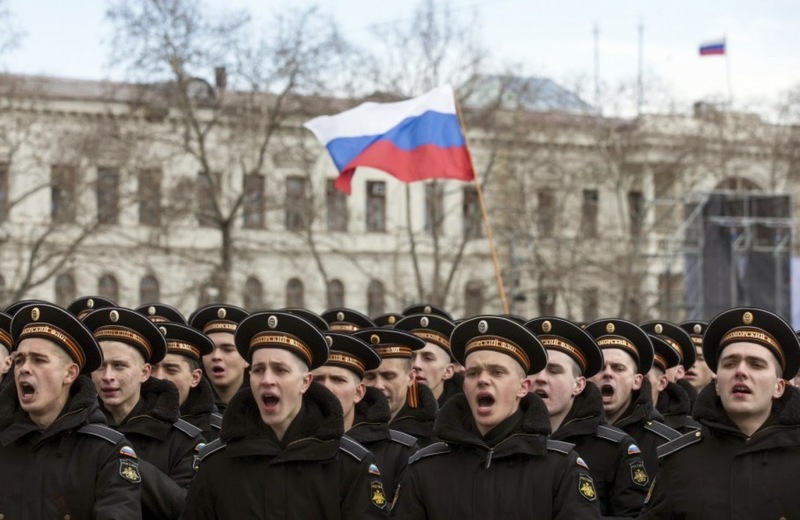 MOSCOW, Russia -- The ongoing war in Ukraine recently passed the first anniversary of the highly dubious referendum that split Crimea off from Ukraine and eventually saw it attached to Russia. Russian Navy sailors take part in a festive ceremony marking the first anniversary of the Crimean treaty signing in Sevastopol, March 18, 2015. Over the course of the conflict that followed, over 6,000 people have died, large swathes of eastern Ukraine have been destroyed, and Russian support for separatists rendered insecure by the change of government in Kiev has gone from highly suspected to fairly open. Reaction in Washington has been equally vitriolic with politicians and commentators pushing for President Obama either to escalate the challenge to Russia by providing greater amounts of military aid to Ukraine more quickly or to come to some sort of great power accommodation instead, effectively ceding a low-importance country in exchange for an end to the conflict to a much more resolved adversary. Recent expert interviews conducted by my colleague Andrej Krickovic and I here in Moscow on Russian strategic interests, and insights derived from the bargaining theory of conflict, suggest that the current policy – doing little at the cost of watching the collateral damage rise – may best fulfill U.S. foreign policy interests by refusing to give Russia the fight it wants at the time and issue of the latter’s choosing. For a recent paper, Krickovic and I interviewed a number of foreign policy experts here in Moscow to understand the extent of Russian strategic interests. The interview subjects clearly indicated that the war in Ukraine is a symptom of greater dissatisfaction with the post-Cold War international order. The experts further stated that the potential loss of Ukraine directly threatens Russia’s ability to pursue Eurasian integration, which is central to the country’s larger strategic vision of developing a Eurasian bloc (through bolstering the Eurasian Economic Union and the Collective Security Treaty Organization) to resist the consequences of U.S. unipolarity and to compete in the multipolar world it expects to emerge. In terms set out by our interviewees, Russia seeks a “grand bargain” that explicitly identifies the role of the United States in the international order and puts limits on U.S. behavior to make America more predictable in its behavior and to prevent it from overstepping its own authority. Three tenets of this bargain that would assure Russian security include a collective security treaty binding Russia, the United States, and the leading European states; a supranational decision-making body (Security Council of Europe of NATO, the European Union, and CSTO) as previously proposed by Dmitry Medvedev that would end NATO dominance in Europe; and a “Monroe Doctrine” for the post-Soviet space that legitimizes a sphere of influence in the region. These ideas follow along Vladimir Putin’s “collective leadership” offer at the latest Valdai meeting: a new world order based on competing hierarchies of states, mutual non-interference in spheres of interest, and coordinated responses to transnational problems of mutual interest, such as Islamist terrorism. Eventually, all these institutional developments would lead to an “integration of integrations” so that a bigger EEU could associate with the European Union and other Western institutions as a full-fledged partner enjoying the same status as these powerful institutions. These terms set out exactly why Russia is motivated to fight over the resolution of Ukraine now rather than later. By Russia’s own bloc-oriented view of the future of international relations, the failure to “get” Ukraine means that the Eurasian bloc has roughly reached its apex (Kyrgyzstan will accede in May 2015 while other regional states are seemingly getting cold feet). Facing a negative shift in future bargaining power means that it should fight now before it gets too weak in the future to mount a credible challenge to revise the international order later. This very well explains what Russia is doing, but how can we explain Obama’s reluctance either to commit greater resources to the conflict or to cut bait and leave? Why has Obama settled on a policy of seemingly strenuous inaction? It is very likely that Obama can observe that Russia’s bloc-oriented strategy has led to the same apex, and that future decline by Russia’s own standards is approaching. Thus, to accommodate Russia in this bargaining framework would not only involve upsetting European allies and the Ukrainians, but would give a lifeline to an adversary by ameliorating the decline. Moreover, to challenge Russia over Ukraine would be to escalate a conflict that the United States is less able and less resolved to win with acceptable costs. This places Obama in a different position relative to formulating strategy regarding a rising challenger like China that needs to be accommodated or challenged because the latter is dissatisfied with the international distribution of benefits. Russia is instead a declining challenger (by its own standards) that offers the United States a third policy course of maintaining the status quo and waiting to negotiate later from a position of greater strength. If Obama believes that Russia has internal structural contradictions (resource-dominated economy) and is externally at its peak, then he finds himself roughly in the same position as Dwight Eisenhower roughly 60 years ago: confident of prevailing in a long war or arms racing against an adversary with internal structural contradictions (command economy), but wary of entering into short-term conflicts close to Russia. Just as Eisenhower failed to intervene in Hungary in 1956, Obama is failing to intervene decisively in Ukraine and giving Russia a fight at the latter’s time and place of choosing. The policy of strenuous inaction of helping Ukraine to prevent collapse but insufficiently strongly to avoid challenging Russia runs the risk of allowing events on the ground to run away from the United States and opens up Obama to considerable domestic and international criticism, but it may leave the United States in a much stronger position vis-à-vis Russia later on – even at the cost of death and destruction in Ukraine and the precipitous decline of bilateral relations. Obama's lack of action is simple to explain based on his experience, and lack thereof. He does not understand his duty to the United States and to the West as a leader. He is incapable of making a decision to go to war because he does not understand history and how it WILL REPEAT ITSELF unless strong leaders stop the repetitive evil nature of tyrants, and despots.